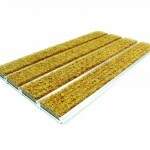 High performance rigid aluminium based entrance matting systems. All designed to effectively protect internal floor finishes by removing dirt and moisture. Choose from a diverse selection of 11 infills including London Underground section 12 rubber and sustainable, colourful Tretford. Each infill providing specific properties and designed for specific uses. Entrance matting that is easy to maintain, with unique removable and replicable strips as well as being durable and long lasting. Typically 4-5 day turnaround with a 15 year guarantee.